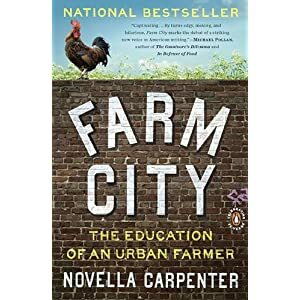 Whether you are a fan of organic farming, urban redevelopment, social justice, or just plain good writing, you will thoroughly enjoy Novella Carpenter’s Farm City. Detailing her move to the ghetto of Oakland and her adventures as an urban farmer, Novella writes with humor, candor, and lyricism that would impress any critic regardless of topic. Her chronicles of late night dumpster dives to feed her pigs, rabbits and chickens, reflections over her complex and mixed emotions over killing and preparing animals she has raised and defended, and the character sketches of the people inhabiting her neighborhood are all extremely engaging. Carpenter’s work inspires conscious and deep reflection on how food is produced and appreciation for the effort and emotion required to put together a meal. Before beginning Novella’s account of city crop cultivation, I wondered to myself about what kind of personality would be willing to move from idyllic Portland, Oregon to the concrete jungle. My preconceptions ranged from the Flighty Hippy and the Idealistic Environmentalist to the Anarchist Off-the-Grid Warrier and Starving Activist. Surprisingly, I found Carpenter as someone I would be delighted to have a close friend. Her passion for food and its connection to community and social justice is evident through her generosity. She shares her harvests with neighbors, inner-city literacy programs, friends, and anyone off the street interested in her garden. Her sense of humor and clear-eyed observations of her neighborhood cut through any bucolic delusions of saving the world through a backyard vegetable plot. She acknowledges the hardships and squalor or Oakland’s gang and drug scene, poverty, and urban decay. Bleak profiles of city life are contrasted with impressions of nature trying to eke out an existence along with the inhabitants of the ghetto, stories of charity and potlucks, and self-effacing evaluations of her own personality. Carpenter is candid with her joys as well as her anger, frustrations and disappointments (see the story of her possum “murder” or vitriolic description of the woman who butchered her pigs). A lady who can raise her own food, learn to cure her own meat, dumpster-dive for scraps with a headlamp and brave the inner-city with grace and humor is someone I can respect. Let us know if you have any further book review suggestions! Ladies: being the environmentally conscious fashionistas that you are, you have committed to buying natural, sustainable fibers such as bamboo, hemp and organic cotton, purchasing fair trade accessories, and maybe even doing a little sewing to re-purpose old, worn out clothing. Yet, as you are in the bathroom getting ready before a big occasion where you want to look your best, you gaze down at ye olde makeup kit and see nothing but brightly colored chemicals that are soon to find themselves applied dangerously close to vital sensory organs. Luckily, there are more non-toxic, eco-friendly alternatives to keep you stylishly up to date and still remain in Mother Nature’s good graces. 1. Nail Polish- Anyone who has ever nearly been knocked down by the fumes emanating from a freshly opened bottle of nail polish could be reasonably suspicious as to the ingredients making up the little pots of enamel. While the names for the various shades sound flirty and attractive, their components, such as formaldehyde (a known carcinogen and industrial disinfectant that can also cause dizziness, headaches, eye and respiratory problems, heart palpitations, and death when ingested) toluene (capable of causing neurological damage due the body’s inability to process the chemical) and phthalates (endocrine disrupters linked to obesity and birth defects in mice) are decidedly less compelling. For vegan safer alternatives, take a look at The Chic Ecologist’s list of nail colors featuring Sparitual‘s vegan line, No Miss natural and cruelty-free shades, Priti NYC which also offers polish for kids, and Zoya‘s huge collection of colors. Other “3 Free” brands, or lacquers that do not use the hazardous chemicals mentioned above, are Sheswai and Acquarella. 2. Lips- When offering a smooch, you might not want your lips to be associated with coal tar, sheep fat, petroleum, artificial stabilizers, lake dyes (which can cause cancer), lead, pigment producing insects or chemical preservatives. Some nasty components of lipstick like methylparaben have been linked to cancer and endocrine disorders. Others like retinyl palmitate have proven to be toxic to pregnant women, and others such as acetate and propylparaben are moderate irritants. For a kiss without concern, use products with natural ingredients. NVEY Eco Lipsticks and Lip Lustres come in a diverse palate and are made from elements that you can actually pronounce. 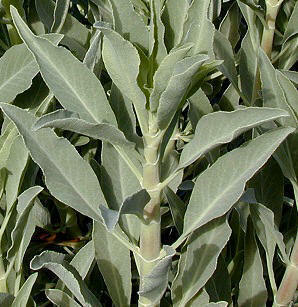 Honeybee Gardens acts as balm and tint in one, and Vapour Organic Beauty makes a myriad of lip products. 3. Eyes- Bet you never thought that what you added to your eyes could so drastically affect your lungs, kidneys, reproductive system and liver. Phthalates, which keep mascara from running can keep your bodily processes from running as well. Depending on the brand, dangerous color additives, preservatives, emulsifiers and even small amounts of mercury can be found in the composition of the cosmetic. Alima sells relatively inexpensive minerals-based shadows in addition to loose powder eyeliners. For cream shadows, RMS has several colors that also double as nourishing eye creams. For mascara, direct your eyes towards NVEY’s formula in either black or brown. For a liquid liner, take a peep at Suncoat’s smudge resistant mixture in several varieties. For more cosmetic reviews and safety ratings, visit EWG’s Cosmetic Database to evaluate your favorite brands. What do you have in your cosmetic bag?